This menu started with the plumcake. I had the first British plums the other day, and they were gorgeous. 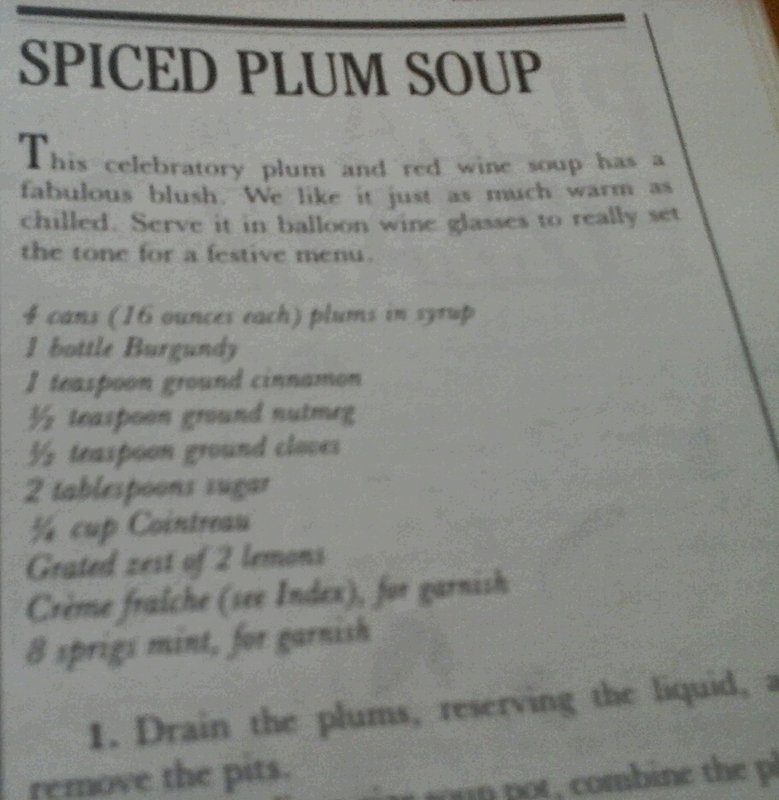 What can I cook to showcase these plums I thought, and this German cake popped into my head. And so I built the rest of the menu around it. There are 2 essential points to this process. The first is my wish to share the pleasure of these plums. I like to feed people, make them happy, by giving them the opportunity to experience what I did through tasting these fresh sweet juicy plums; a moment of absolute connection to whatever it is what we are part of. The second is the idea that the plums are using me as an instrument to show their beauty, and not the other way round. I am not using them to accentuate the artist master chef in me. It is the old platonian idea that the art, the ideas, the recipe is already there in the world around us, waiting to be picked up. You just have to open up and tune in. When people hear that I am serving them something which I have never cooked before, they admire my bravery. But they also find it hard to disregard the scientific approach to cooking. How did I know the dish was right, good enough to serve? Shouldnt I test recipes, refine them till they lead to the ultimate, perfect dish, like scientists in a lab refining their theories to get a better grip of the world? We live in a contradictory world, because they might expect this from a professional like me, but they are not doing it themselves when they are cooking at home. Prue Leith complained recently that nobody is using cookery books anymore, they have become coffee table products. If you want a recipe, you google it. A cookery book without glossy photographs is not selling and doesnt even get printed.The majority of people commenting on this said they were using cookery books ‘for ideas’. It shows that the days of cookery books as manuals, centering on the methods instead of the ingredients, are over. We’ll try one recipe from the internet, and if it is good, we’ll make it again. If not, we’ll try another. In a way, I am glad people no longer treat a cookery book as a (dogmatic) bible. The main quality is that it should be inspirational, and glossy photographs might help with that, but are not necessary. Some of my favourites (Julee Rosso and Sheila Lukins’ New Basics, Jane Grigsons Vegetable Book) just have illustrations. What makes them inspiritional is that they evoke so much more then just the image of the pretty perfect end result. Time and time again I am gripped by how much fun cooking is when I go through New Basics. Reading the Vegetable Book indeed makes you want to serve the vegetables in their own right. In another favourite, Jerusalem (Ottolenghi), glossy photographs give you a glimpse of life in a divided city, and when you are cooking the dishes from the different traditions, you feel the uniting power of cooking. from Ken Hom, The Taste of China. You see, there are bestselling cookbooks which are kept on a shelve in the kitchen, and not on the coffee table. These books are not about cooking methods, but are inspirational, because they centre on the changing seasons, and all the goodness the earth is offering us. Often I get asked what my speciality/favourite cuisine is. And always I forget to answer: the joys of June. The soft whites and pinks of May, the month of expectancy, have made way for the blood red fruits of love. My heart skips a beat when I spot the first real sun ripened strawberries, raspberries and cherries. For me, it is as with these fruits nature is saying ‘I love you too’. Its is the sparkling burst of abundance which I so love about these last weeks. The vegetable boxes which my local farm has started again are overflowing with green leafs and crisp new carrots, potatoes and onions. Tasting a freshly picked cucumber you realise how much flavour is lost with wrapping it in plastic and transporting it. June is the month for haying. The smell of freshly cut grass is loved by so many people I think because it makes them feel right in the middle of summer, when the sunshine is still sparkling. 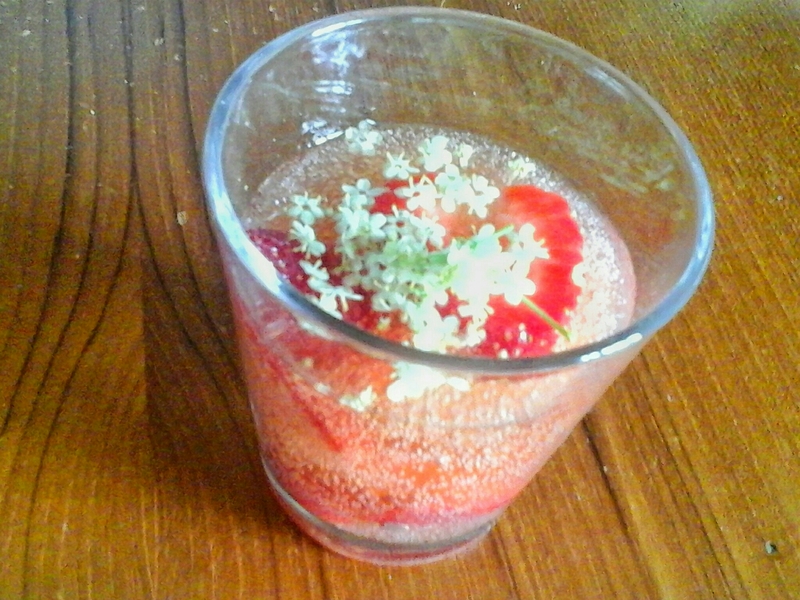 Strawberries in Ginger Ale Jelly are the optimal foodification of this sparkling sunshine in a glass. You could use champagne but I like the extra zing of ginger. Gorfennaf is the Welsh for July, and it means the end of summer. That’s a bit premature I hear you say, are summers in Wales that short? But it harbours a grain of truth. Nights are shortening. From now on summer is ripening, drying out. 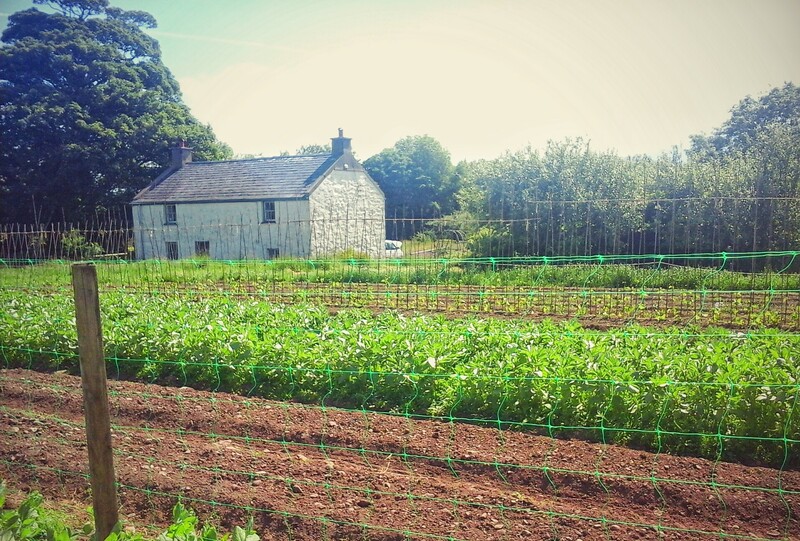 The next few months are all about harvesting, and conserving the crops for winter. Not long before combines almost cowlike graze the fields of golden grain, and digest it, seperating the wheat from the chaff. The revitalising sparkle has left summer. It is about maturing now. That is why I like pickles so much. The vinegar adds the bit of zing which got lost. 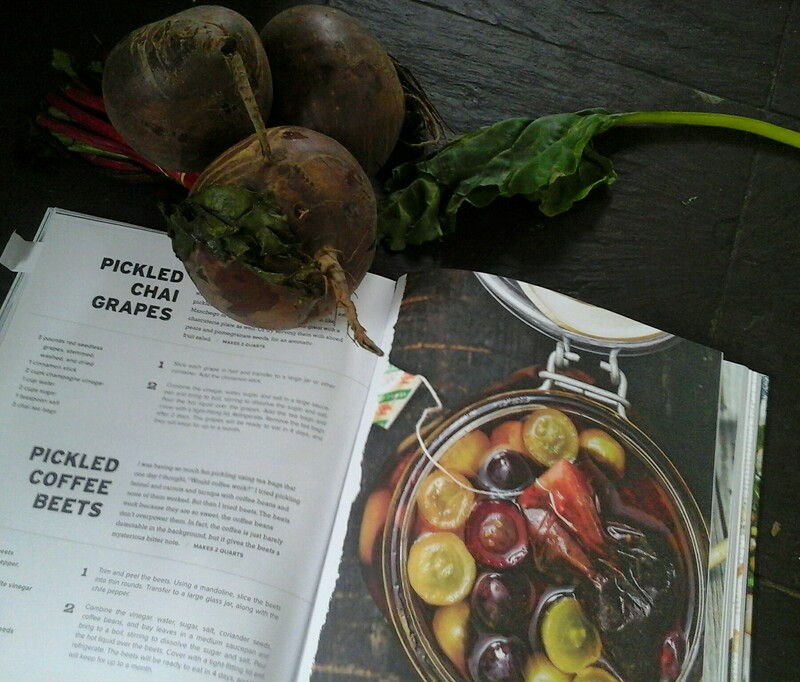 Recipes for the peaches and coffee beets on this weeks menu I found in the very inspiring ‘Smoke and Pickles’ by Edward Lee. Preparing for next weeks Welsh cultural festival Gwyl Arall I talked to Carwyn Jones, who set himself the challenge to live of the land and the sea for a year. 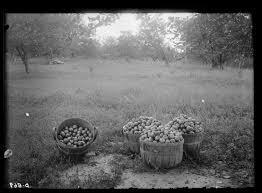 While I am jubilating the abundance of vegetable and fruit produce, for Carwyn these are difficult months. There is not much to hunt and fish for. He’s trying hard to catch that shyest of fishes, sea trout. Although there is an element of sport, achieving the catch, it is mostly about becoming one with nature, feeling almost what the trout is doing, and simulating with your ‘fly’ the movement of small fish it is hungry for. If you eat it, you have to be able to kill it, is Carwyns motto. When you kill an animal for meat, it should be done with respect. That is the word which ressonates with me most. 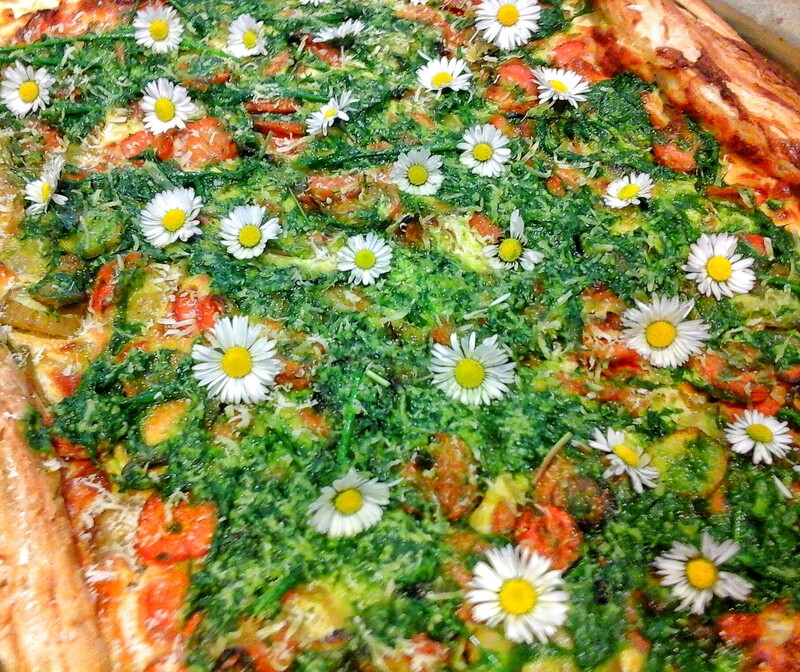 Cooking is not an art, sport or nutritional necessarily action, but paying respect to what nature is giving you. Your way of saying ‘I love you too ‘ to the earth and all what it is providing you with. Next week I am collaborating with a local artist. Her work evolves the fragments of household ware that are on the steep slope behind her home. The earth is churning up the contents of a waste tip which was used by the inhabitants of her cottage about a century ago. 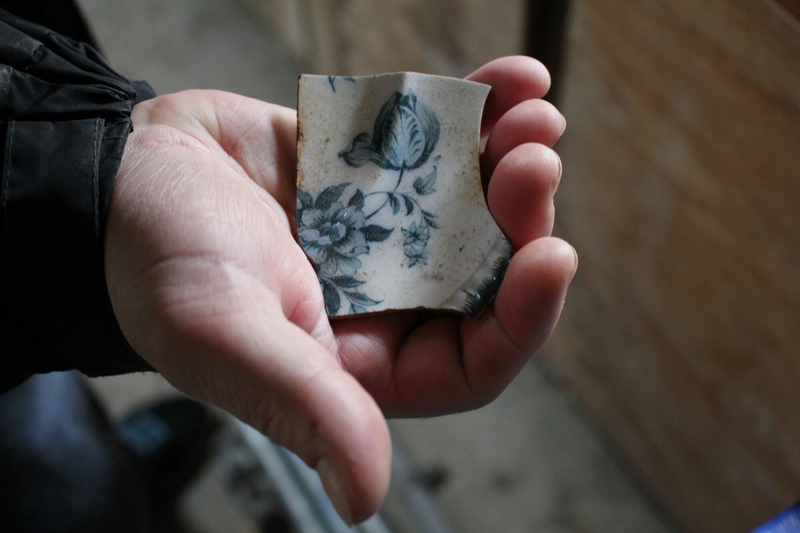 The rain has washed down broken china, shoes, perfume bottles and complete earthenware jam jars. At first I marvelled at how beautiful these reminiscences of a past hard life are. Then I realised that the true beauty for me is the earth bringing it all up again. And giving it a new life as it id used as part of an artwork. That is the essence of spring to me. The earth breaking up and providing us with a new life. I do feel particularly revived by spring this year. 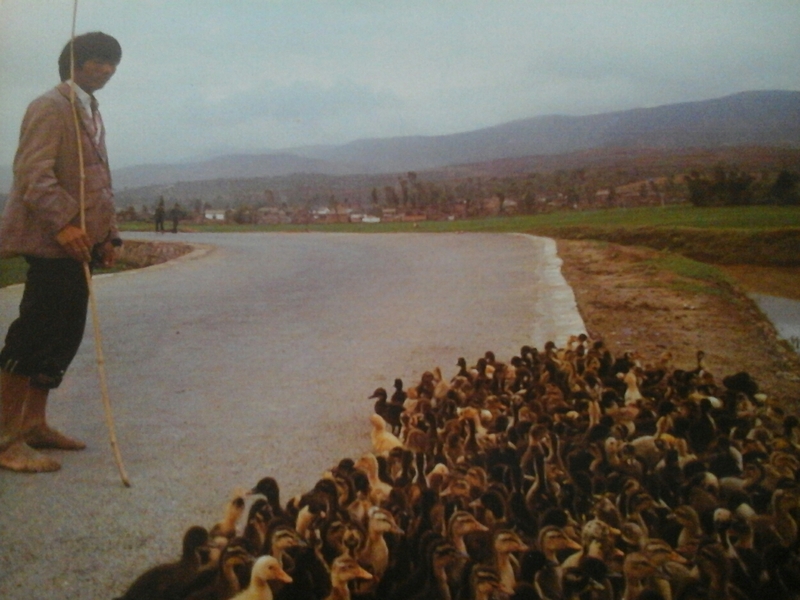 When I was walking about at Easter I noticed how abundant nature already is. Shaded woods offer plenty of wild garlic to make a pesto. I use hazelnuts and any hard cheese in mine. Tender dandelion leafs are sprouting up everywhere, and are good in a potato salad with toasted pumpkin seed oil, which is a memory of Austria for me. Heavenly scented bright yellow gorse flowers make good wine or a cordial. Just soak them overnight in a taken of the boil syrup. 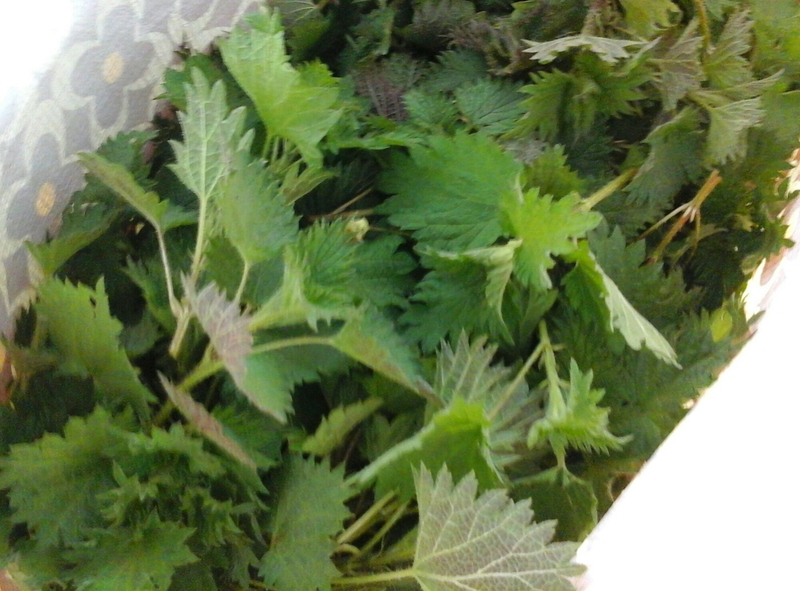 Nettles are just right at the moment. Tingling more then stinging when you pick them without gloves, like I did. 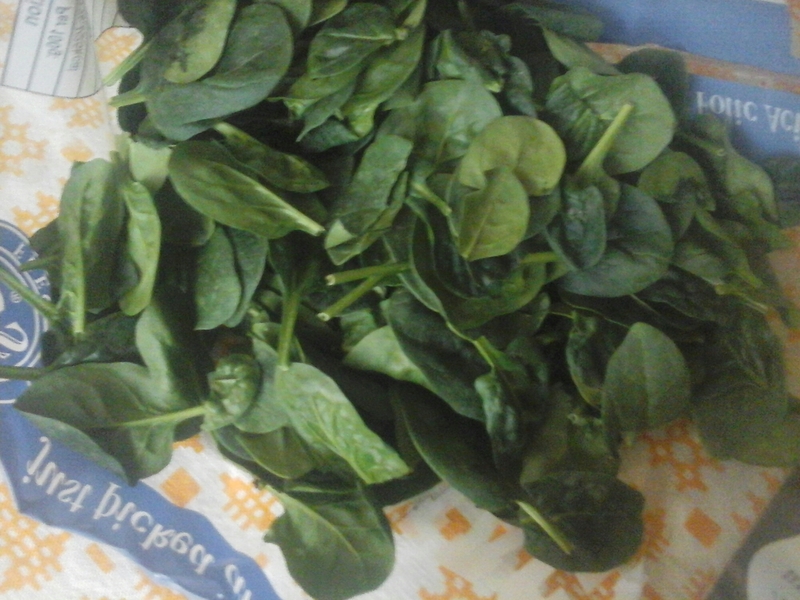 Use them as spinach, in a pie for instance. Or with butter toasted oats in a soup. Always think spring is one big egg with all these white and yellow flowers around. So many of them are edible. Daisies are a favourite of mine. Tiny sunshaped hearts which open themselves to the sun. The turn a dish into a smiling plate of food. 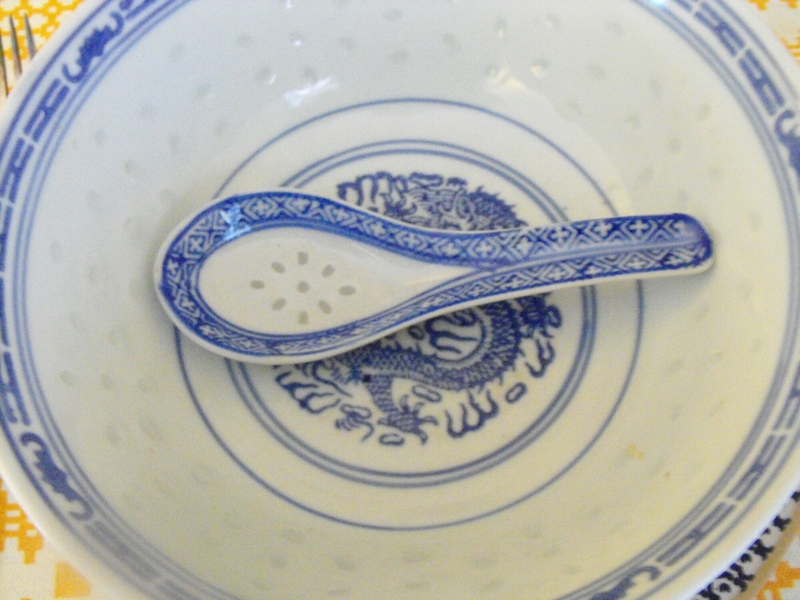 The knife is the symbol of modern cooking. It is all about fragmenting food, slicing it, breaking it up, grinding or blending it. But in the end it is the becoming one when we eat all these fragments what matters. We had an orchard when I grew up, and I still love apples. For the Bistro night last week I cooked a Pompe au Pommes (apple pie) from ‘Floyd on France’ and it reminded me of how the simplest of recipes are usually the best. The ingredients were: flour, butter, salt, apples and sugar. The hint of salt in the perfectly crunchy shortcrust worked fantastic with the smooth apples which had just the right sweetness. Only 5 ingredients working together in perfect harmony. 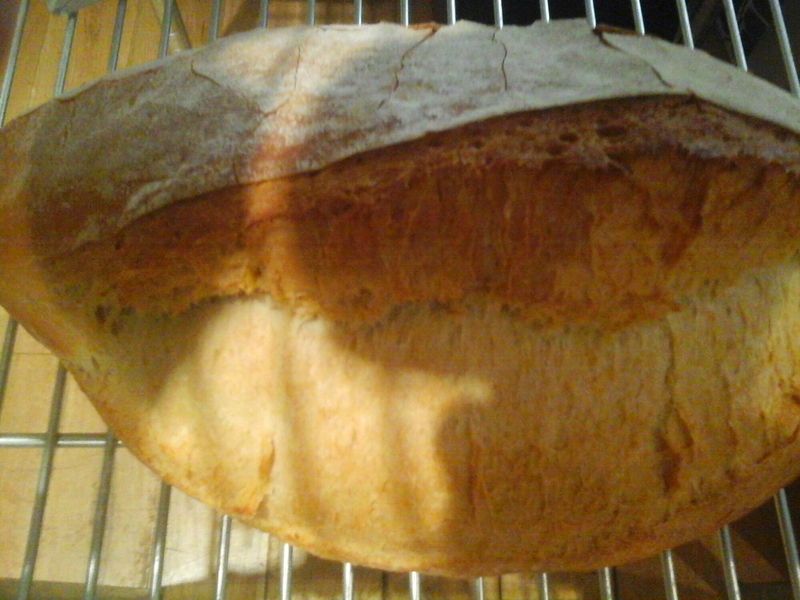 There is something very reassuring about being able to produce something so nice out of the simplest of ingredients. You can almost invision a French peasant wife baking this apple pie in her Normandy kitchen in the beginning of the 20th century. It is a traditional recipe, embedded in daily life, connected to the land and for me, in that way, to the essence of life. Food like this you find all over the world. Korea is this week’s theme in Oren. 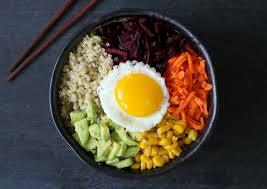 When I travelled there in 2007 I discovered that Bibimbap -mixed rice- is the national dish. Another example of the perfect combination of simple ingredients. Rice as the smooth operator, with a velvet runny fried egg, uplifted by hot chilli paste and crunchy vegetables. Yes, comfort in a bowl. The first time I had it I was not impressed, thought it was too simple. But then when I had it again I realised it fed me, and not only in a nutritional way. With the modern accents on diets, allergies an the appearance of food, we can almost forget the most important thing. That it should feed body and soul. This week I am cooking Roman. It usually evokes images of toga clothed men lying around the table, feeding themselves as young birds with wide open mouths, holding up bunches of grapes. 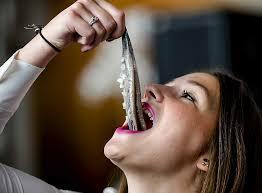 An image that for me as a Dutchman rhymes with the Dutch way of eating salted herring. 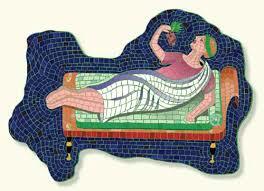 Roman grape eating has almost the opposite connection, that of decedancy. Part of a jetset lifestyle, we think. But that is how we look at it with our modern eyes. I wonder what the Romans would have made of our dinner parties. There is something rejective about those reactions to the Dutch herring ‘happen’ and the Roman banquet. That is something the Romans wouldn’t have liked. The called their banquet a convivium, a ‘living together’. I find modern food culture more and more that of an exclusive one. New European legislation on allergy advice have made a menu in a restaurant almost more about what you can’t eat then about what the restaurant is offering. I know Oren is only covering a niche market, because more and more people describe themselves as picky eaters. The food they choose to eat is used as part of their identity, a way of setting them apart from everybody else, instead of ‘living together’, joining in. When I was a child I hated green beans, because we had them every monday. Now I love them in a good salad Nicoise. I couldn’t stand raw tomato, I melt now when I smell a perfect ripe example. 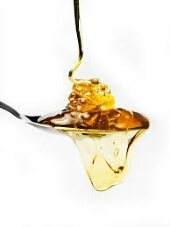 Recently I was given a jar of honey so good, I had a teaspoon as a treat every day. My 14 year old self would have looked at it with disgust. Only with real allergies the rejection of food is a physical thing. For the rest it is a mental switch. And as soon as you have made it, you can discover a world of flavour you might have been excluding yourself from. I am convinced it is better to live together with the world and all its possibilities, then to distance yourself from it. So for all of you who do and don’t like honey, here is finally something the Chinese didn’t invent, but apparently the Romans, a cheesecake. This morning I heared somebody on the radio describing February as a month of nothing, and I couldn’t disagree more. 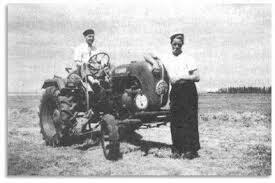 In olden days this was the month the farming year started. Farms would change hands, or rents would be renewed. A month of cleaning out and getting ready. When people were counting moons instead of looking in their diaries, this was the time of the new year. There used to be a pagan festival of light at the beginning of February, in the middle of winter. Christianity turned it into Candlemas, on February 2nd , 40 days after Christmas. The celebration of the Light outside found a form in the blessing of the church candles. Pagans baked round cakes, symbolising the return of the sun. This tradition still lives on on Shrove Tuesday, which is part of the Carnaval period. And that is Partytime!, look at Venice, Brazil or New Orleans. 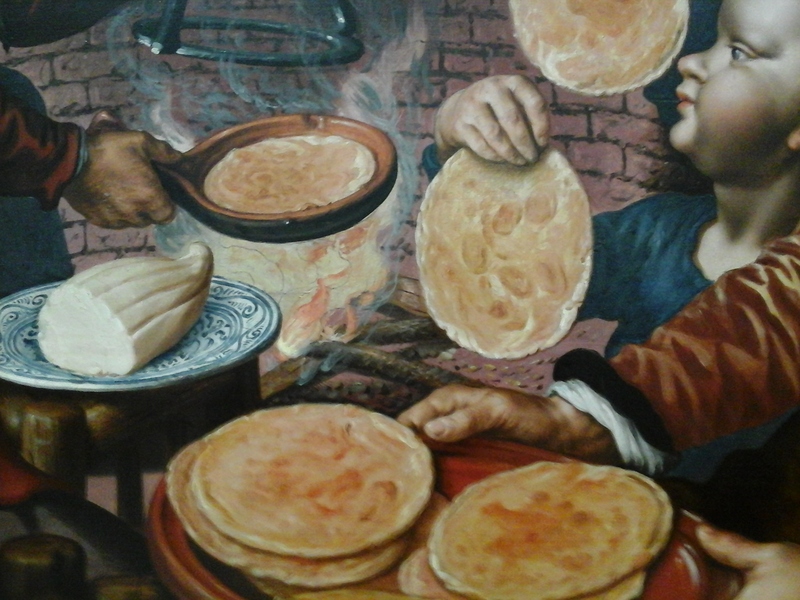 This might be why eating pancakes always seem to be a feast. Yes, this is the middle of winter, a time when there used to be nothing left to eat, and the scarseness of Lent is still to come, but the Light is there, so ‘let’s party’. I am with the Chinese on this. For them the New Year is only starting just now, and it is the biggest party of the year. So a Chinese menu at Oren this week, with 8 (lucky number) dishes, long noodles and red cooked chicken wings. After the party it is time to plan your farming year. Get the seeds of the crops you want to grow ready. What do you want to achieve in your life this year? Start thinking now. Sow your Seeds of Change. 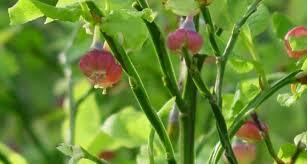 They will germinate during lent, and will rise from the ground at your own Easter. A recipe for some Cumin and Caraway Seed Biscuits here, so you can nibble on them while pondering. I would use Aniseed instead of Cumin.But that depends if you like it more sweet than spicy! Since November 2014 I am popping up. It is an extra challenge for me. Not only do I have to think of a different MENU every week, I have to find a LOCATION as well. But as so often, when one door (to a kitchen) closed, other ones opened. I was invited to the lovely logcabin cafe at Eisteddfa Fisheries, and cooked trout caught in their lakes. 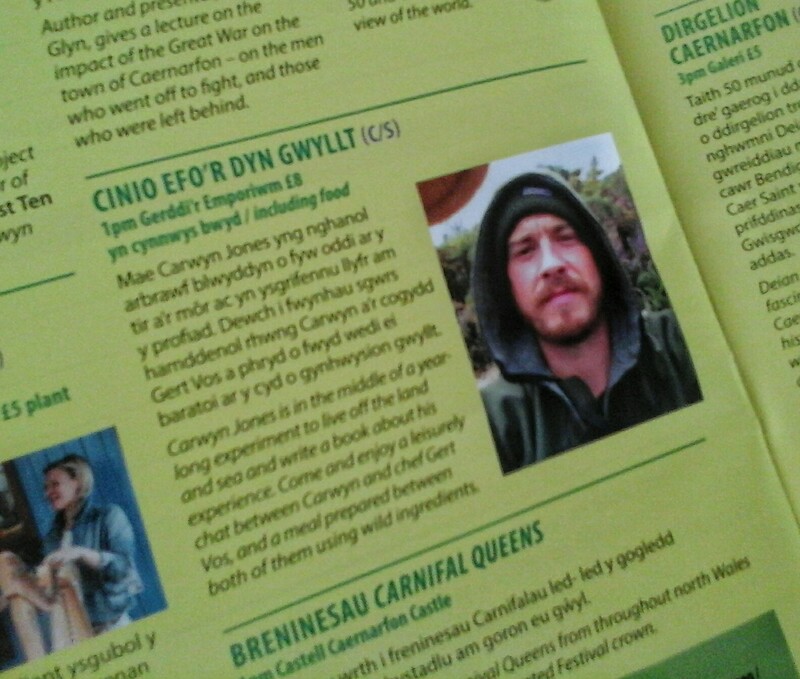 Oren nestled inside the Caernarfon town wall for an evening at the Royal Welsh Yacht Club. 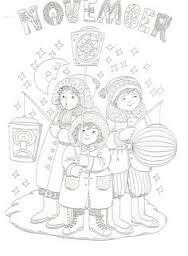 We sang st. Nicolas songs when I collaborated with Scoops Dutch Pancakes and Artisan Ice Cream. While children were listening to Rudolphs Farty Christmas story, I served sprouts at Palas Print bookshop. The help I get from friends, neighbours and local businesses to keep Oren going, is like little lights popping up in these grey midwinter days. A true manifestation of christmas. And being forced to delve into my own creativity is like trying to find the evergreen between the treeskeletons on the barren midwinterland, another one of the christmas symbols. It is good to know that while death seems around us, we are still alive and part of nature’s everlasting cycle. In Britain, I have read somewhere, the juniper tree is the only native evergreen. I’d like this to be true, I love juniper. it clears the muddy taste of my favourite vegetable beetroot into pure water and earth. 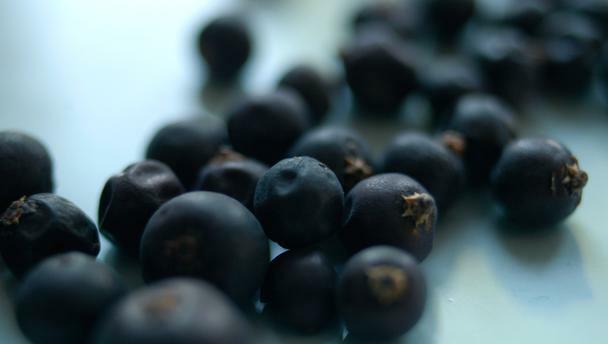 The cleansing effect of juniper comes also to the surface when used in combination of sauerkraut (it gets rid of that overcooked cabbage undertone) and with game like venison (it cures it of its raunciness). The mean medicinal quality of junipers is diuretic, so it helps to purify our body as well. I often get asked for the typical Dutch christmas meal is. 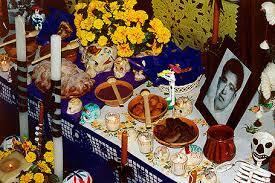 I answer that it is not important what we eat, but that we celebrate it together. Maybe I should say ”Anything, accompanied by a ‘borrel’-Dutch shot of gin”. In a clear glass, preferable this upside down bell shape. For that little drink symbolises everything. The evergreen tree, the purifying water, the grain of life and the ringing bells which tell us of the eternal light. A month ago I had a group of bakers staying with me for a baking weekend, in which they all tried out different recipes and were taking notes of each others comments. While watching them at work I learned how dependent cooks and bakers are on our senses. But while for a cook apart from eyes and nose his tongue is his main instrument, for a baker the tactile bit of feeling the dough is as important. Off course the most important sense to use while baking or cooking is the sixth, your stomach. When I did my chefs training my teacher used to say: ” forget cooking times, you have to know, feel, understand what is going on inside your pan”. Never been one for textbook guidelines, this was a lesson I easily took to heart. For me it’s the zen bit of cooking, zoning in on what your doing, centering yourself (which for me is in my stomach) and be in the moment with, for instance, your wilting spinach in the pan. Yep, that hurts! But at the same time they are fresh leafs sprouting from the ground, glistening drops of water hanging on them, turning into this radiant green full of life. I noticed my baking guests doing it, “being with” the dough. 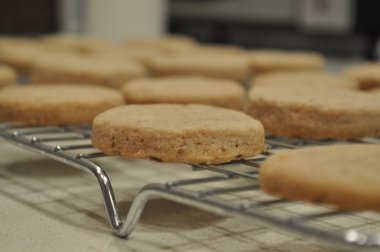 They had their basic technic knowledge, their lists of percentages of ingredients, but in the end, while kneading it, they might decide that they “felt” that they had to alter it, because the air is too humid, or the temperature is too low for the leaven to do its work. We’ve lived in an age where food became more and more functional, broken down to a list of ingredients, nutritional values and technical instructions how to prepare it. Down to the milligram we can know what is on our food. But it doesnt say on the package how much love went into our ready made meal. Luckily there are signs that an holistic approach to cooking gains ground. Watching Masterchef these weeks I noticed how often it is mentioned that contestants have to put love and passion into their food, apart from being technologically skilled chefs who can cook something tasty. I often get the question if I try out dishes. That would be an immense task with a weekly changing menu. 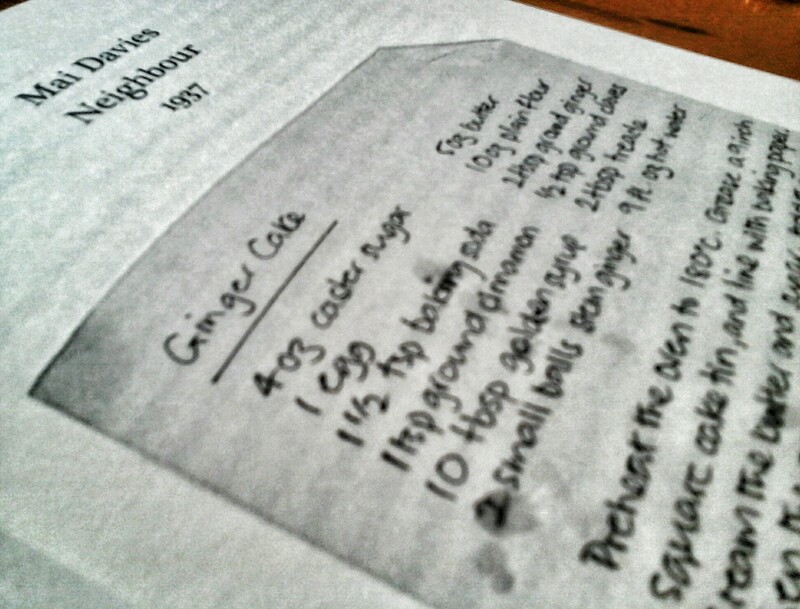 I trust my stomach and my basic technological knowledge enough now to just give a recipe a go. 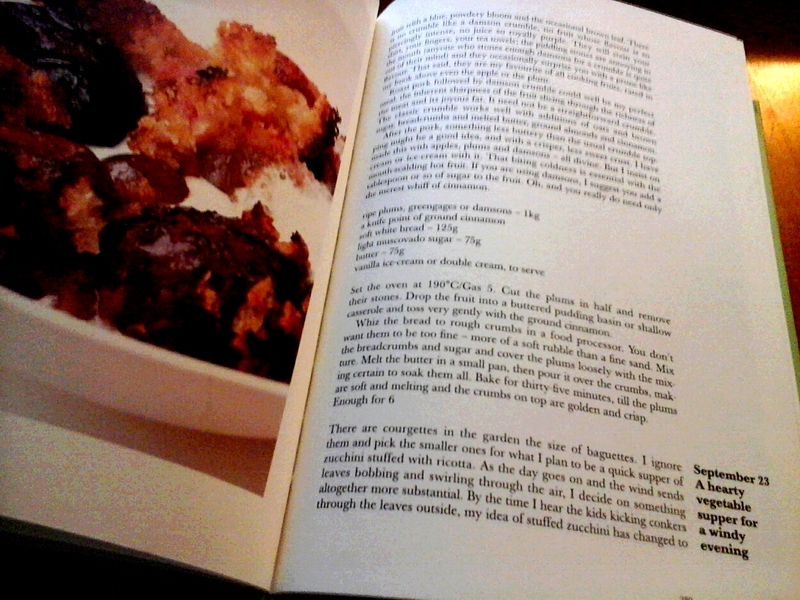 I use cookery books for inspiration, not to find that technological perfect recipe. 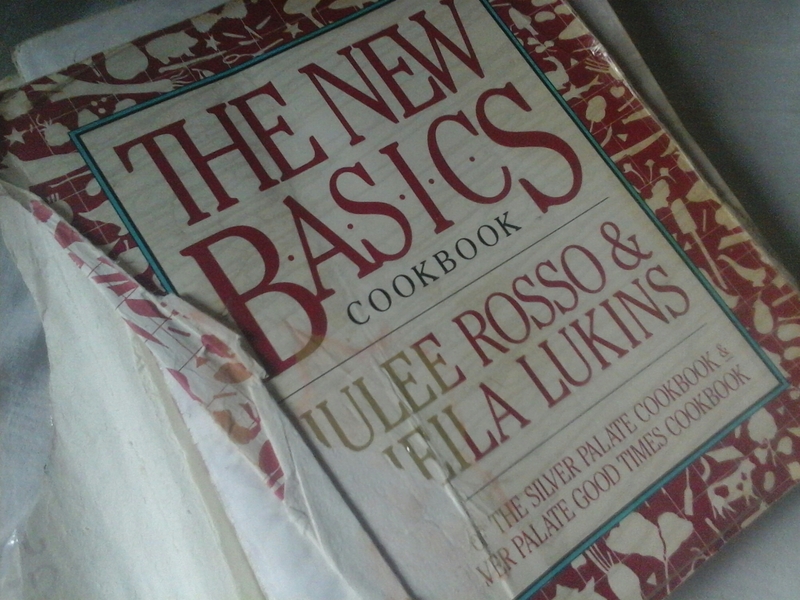 One of the first books to give me that, because of the love for food with which it was written, is ‘New Basics’ by Julee Rosso and Sheila Lukins. 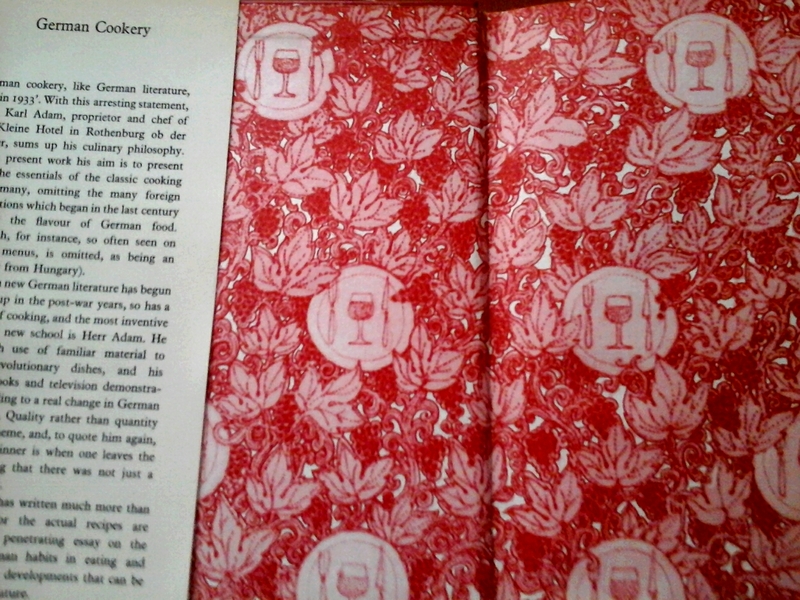 It looks the most well used out of all the cookery books in my collection, and not without a reason. To honour them, and to urge you to trust your stomach as a New Basic of your cooking, this week a menu with a selection from that book.